If I had to name my favorite soup, it would be miyeok guk. I make it 2 to 3 times a month, eat it for a couple of meals and then freeze the rest to eat again later. Miyeok guk is made with dried miyeok (aka wakame), which is a sea vegetable (edible seaweed). I love the briny flavor of miyeok and its slightly chewy, slippery texture. 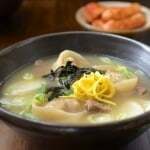 As I explained in my previous miyeok guk post, this staple soup also is the soup that new moms eat for the first few weeks after giving birth because of the nutrients contained in miyeok that help with recovery and the production of breast milk. 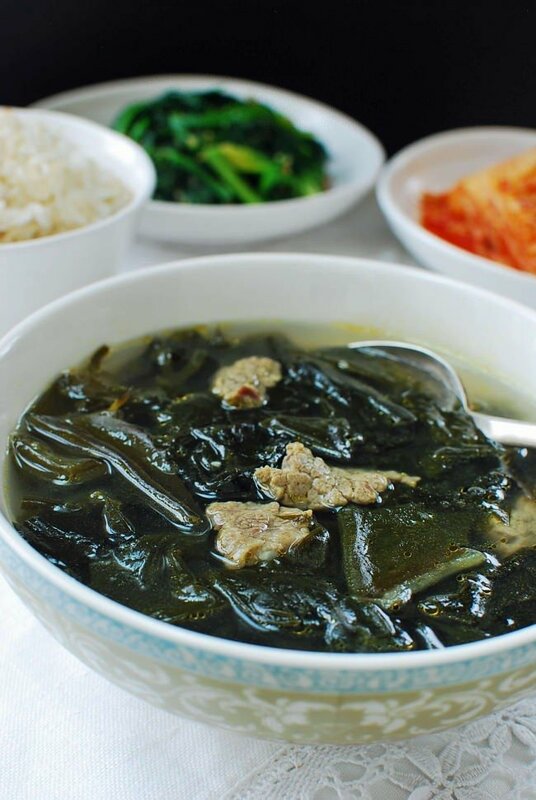 In Korea, this soup is part of the hospital diet for new moms. If you’re in America, your Korean mother (or mother-in-law) probably brought a big insulated jar of it to the hospital to feed you after your childbirth. Because of this soup’s association with childbirth, it’s also a Korean tradition to eat miyeok guk on birthdays. The recipe I posted over 3 years ago was made with mussels. Here, I made it with beef. 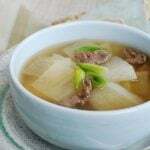 There are two common ways to make a Korean beef soup base. The method I used here is the quicker method. 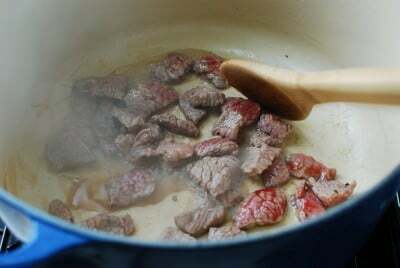 The thinly sliced beef is seasoned with soup soy sauce and sautéed before being boiled in water. 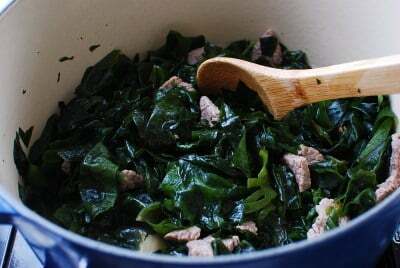 The other method boils the big chunk of meat with aromatic vegetables for a long time until tender. The meat is then shredded and added to the soup. I often use the latter method for a deeper flavor when I have time. 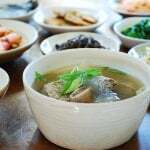 See my tteokguk recipe for instructions for making the beef broth using the longer method. For Korean beef soups, brisket (양지머리, yangjimeori) is the best cut to use. While the brisket takes longer to cook than some other cuts, the resulting broth is much more flavorful. 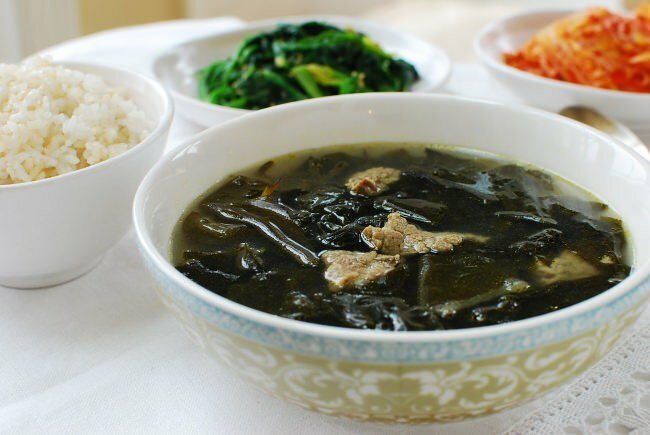 Miyeok guk, also known as birthday soup in Korea, is a soup made with dried miyeok (aka wakame), which is a sea vegetable (edible seaweed). Add the miyeok and 1 tablespoon of soup soy sauce, and continue to sauté for 4 to 5 minutes. Great recipe. I love it because is goid snd makes you strong. Came out delicious! I made this for my Grandmother’s birthday and she loved it! Thanks. Hi Sophia – I’m so happy to hear your grandmother loved it. I’m sure the soup was extra delicious because of your love for her. Happy birthday to grandma! Hi Ami – Yes saute the miyeok first and then add the broth. 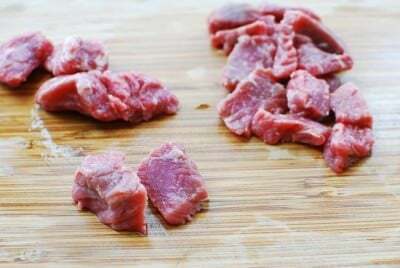 You don’t need to saute the cooked meat. The meat from the ddukguk/tteokguk recipe should be very tender, so you can add it to the soup with a few minutes remaining. Hope this helps. I love miyeokguk, so nutritious. Thank you Hyosun for this recipe, it is my go-to recipe when I’m craving for some. Thank you! It’s my go-to recipe as well. So delicious! 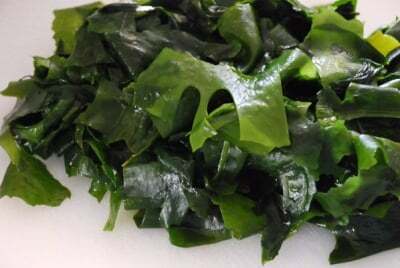 What is the diference btw wakame cut and ottogi cut ? I got both and don’t know wish one is better fot the soup? “Ottogi” usually means a brand name. Both may simply mean they are pre-cut. If that’s the case, either one should be fine. If this is not answering your question, please send me photos of them. 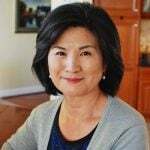 Been looking for great Korean recipes so I can make it for my children because I want them to embrace their heritage!!! Thanks for all these! can i use normal soy sauce which is not gukganjang? And is normal soy sauce and gukganjang different? Yes, they are different. Not a good substitute. The regular soy sauce. will be too sweet and dark. You can use a little bit if you want and season more with salt. A better substitute is fish sauce, which is sometimes used in Korean soups. Hope this helps. I didn’t have the gukganjang, but I had fish sauce. Came out great! How do I store this? I I feel like I should put in the fridge but I remember my mom used to leave it out..
You can leave it out for a few hours if room temperature is cool, but I generally keep it in the fridge to be safe. Or freeze if I’m not going to eat it within 3 to 4 days. Hope this helps. 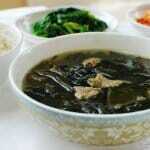 Women in Korea typically leave these soups and stews on or near the stovetop. Every morning, they turn on high heat to bring it to a boil and then turn it off after 5 minutes of boiling in order to kill bacteria. This is done for a few days until it is all eaten and is done in addition to heating up for a meal. My late wife, who was Korean, did this all the time and the soups and stews never tasted bad, went bad, or made any of us sick. What would be the best beef I can buy at the supermarket to use for the soup? Either stew meat or brisket, but you can use any flavorful cut, like flank steak, short ribs, etc. If using a tough cut of meat, you’ll need to cook longer. Hope this helps. Enjoy! This was one of my favorite instant soups when I lived in Korea. I would dump a heap of lemon vinegar into it (which I was faulted for by any Korean who ate it). Would love to make it from scratch, which I hope I can do as there is an HMart right by where I work now. A friend of mine made this 4 me after I told her how much I loved it when being at a Korean Spa. My was it delicious. I ate it till it was gone and was upset there was no more. NiNi I thank God for you and the recipe from MOM’s HOME COOKING. Aww what a nice friend! And I thank YOU for the shout-out. Thank you for your recipe. How do you make this recipe with chicken? 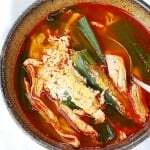 18 yrs ago after the birth of my last daughter my Korean sister in law made me a pot of miyeokguk everyday for a week and was addomate that I ate it.. Yes that’s what we Koreans do. Eat this soup until you can’t even look at it anymore after giving birth. Nice sister-in-law! Hi! I’m going to try this tomorrow. I just have one question- is it possible to overcook wakame? 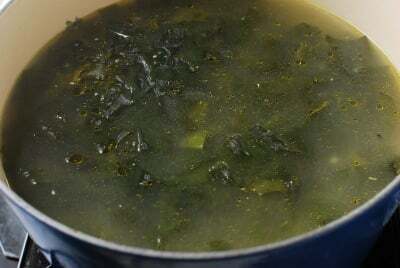 If after 30 minutes my beef is still not as tender as I’d like it to be and I decide to simmer it even longer, can wakame overcook and become too soggy or something? You can simmer it longer. Wakame will turn soft but it will be okay. You can also stir fry the meat first and boil for a while before adding the wakame. Sorry about the late reply. I just came back from a trip and had limited internet access. If you already made it, hope it turned out well. Thanks for using my recipe! Cheers! I haven’t yet, I’ll be making it next week, thank you for the reply! You got it! I sometimes use both of them too. Thank you for the love! Hi! I tried making this tonight as a practice for when I give birth (I’m a month away! ), but I realized after making it that it was… Missing a little something from what I remember my grandma made. I’m not exactly sure what it could be! It lacked any actual taste, and all I tasted was saltiness… Should/could I add some sogogi dashida next time? I don’t use sogogi dashida, but you can if you’re used to do it. It’s a flavor enhancer which, I believe, has MSG in it. i wanted to know what do u mean of (miyeok)?…I mean What kind of vegetable it is in english? And if i could not to get it what kind of vegetable i can use instead of it? 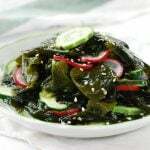 Miyeok is a sea vegetable (edible seaweed) and also known as wakame in America. There’s really no substitute for this soup because the soup is made with miyeok is called miyeok guk. If it’s made something else, it won’t be miyeok guk. Can i add silken tofu into this soup? Will it spoil the taste? No I don’t think it will. Try to use firm tofu. Hello! Thank you very much for your recipe! Can I double this recipe and turn out ok? Of course! It will be fine. Enjoy! You’re welcome! Hope you try it soon. This is probably my favorite Korean soup. Can I use seolleongtang (that I made before and froze) as the base for miyeok guk? Do I still need to saute the brisket with the seaweed and gukganjang? I don’t have any more brisket from the seolleongtang left so I want to add a fresh brisket to the miyeokguk. Seolleongtang will be a nice soup base this. It will be delicious in a different way. Enjoy! LooooooooOoooooooove this!!! It tastes just like my Harmony’s! Love your site! 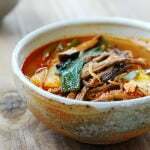 What is the recipe for the longer version of your beef miyuk-guk (cooking beef separately then shredding) that you mentioned in this recipe? I’m going to give this a try for my student worker’s 20th birthday. It looks good! aww how nice! I’m sure your student will love it. Hi, could i use homemade chicken broth as the base for this soup? Instead of the 10 cups of water. Thanks for sharing this recipe, i’m looking forward to trying it! Sure! Why not? It will be good. Making this tonight and I told my kids… They said, “Yessssssss…” Always a winner! 🙂 Thanks for the great recipes! Haha that’s great! I always loved it as a child as well. Thanks!